Need something new and exciting for an important business tradeshow, fundraiser, or annual meeting? Need a fun game for your child’s birthday party or school carnival? 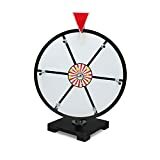 Then you need Midway Monsters’ 12″ dry erase prize wheel.